Rotary Club of Kingswood (Bristol) - Welcome! Hello, we're a friendly and relaxed club with some 30 members, both men and women, and we are keen to welcome new members. Our President would like us to increase our support to the local community and raise as much money as possible for our chosen charities, whilst making sure that we enjoy Rotary. We meet over lunch every Tuesday to enjoy a two course meal with lively discussion and interesting speakers. We enjoy a range of social and fundraising activities - have a look at our Brochure for more information. 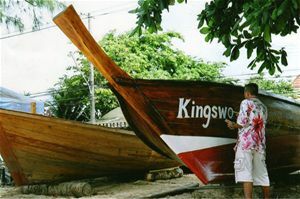 The picture shows the finishing touches to a boat funded by our Club as part of RI`s initiative to help the victims of the Asian tsunami disaster of December 2004. This is just one example of our humanitarian work, both at home and abroad. Guests and Rotarians alike will find a warm welcome at any of our meetings. If you would like to come to a meeting (see details on this page) or find out more about our Rotary Club, please click on CONTACT US at the top of the page.